Report to Houston Intercontinental Airport by 8:00 p.m. and proceed to ticketing counter. Depart Houston, TX on our flight to Taipei. Lose one day crossing the International Dateline. After a short layover in Taipei, we depart for Vietnam. We arrive at Ho Chi Minh City's Tan Son Nhut Airport and proceed through immigration, retrieve our bags, clear customs, and board our waiting motor coach. As we depart the airport, we will pass by the Phu Tho Race Track and the U.S. Army's 3rd Field Hospital. We will continue on thru the center of the city (still called Saigon by most Vietnamese) and proceed to our hotel where you will have the rest of the afternoon free. We enjoy a Welcome Dinner in the evening. Today is devoted to touring sites in Ho Chi Minh City to include: The War Remnants Museum, Reunification Hall (the old Presidential Palace), Notre Dame Cathedral, the Post Office, and the Binh Thanh Market. Early morning departure heading south on Highway 1 we visit the town of My Tho, in the Mekong Delta. We will take a boat trip on the Mekong River to visit Thoi Son Island, and its local houses, and workshops. We continue south to Can Tho where we spend the night. This morning we board a boat to visit the Cai Rang Floating Market to sample some local fruits and cruise thru the market on the Mekong. From here we continue north and visit some sites around Can Tho as we travel back to Ho Chi Minh City. We spend the night in Ho Chi Minh City. This morning we are up early and heading north-west on Highway 13. Our first stop with be Phu Loi Airbase. Continuing on Highway 13 we arrive in Ben Cat. Just north of Ben Cat is Lai Khe and the southern end of Thunder Road. We continue north to An Loc, Quan Loi, and Loc Ninh (the northern end of Thunder Road). Returning south on Highway 13, we make our way through the Michelin Rubber Plantation and on to Dau Tieng before arriving in Tay Ninh where we will spend the evening. This morning we head north from Tay Ninh, passing by the Tay Ninh City Strip and on to Nui Ba Den (Black Virgin Mountain). We return to Tay Ninh and visit the Cao Dai Holy See (Temple). 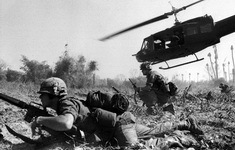 Leaving Tay Ninh we continue on to Trang Bang and into the Operation Cedar Falls area. We then visit the Cu Chi Tunnel Complex. We will pass close to the Iron Triangle and through Hobo Woods on our way back to Saigon. This morning we fly to Cam Ranh Airport at Cam Ranh Bay. If possible, we will stop in Cam Ranh and visit the site of the 22nd Replacement Battalion, the 6th Convalescent Hospital, and the 14th Aerial Port. From here we make our way north to Nha Trang and visit client requested areas along the way. After lunch, we will have the rest of the afternoon free. Dinner on our own tonight. Today is a free day in Nha Trang to explore on your own, relax by the pool or at the beach, or shop. Lunch and Dinner on our own. After breakfast, we drive north to Qui Nhon. Along the way, we pass Tuy Hoa Airbase and visit several Cham ruins (the Cham people ruled what is today's Vietnam from the 3rd to the 15th Centuries), and other interesting sites. This morning we head west on Highway 19 towards An Khe. We drive uphill through the An Khe Pass and over the An Khe Summit before arriving in An Khe where we will have lunch. As we leave town we cross over the An Khe Bridge. Continuing west we pass through the Mang Yang Pass where the French Mobile Group 100 was ambushed and annihilated on June 24, 1954. We finally arrive in Pleiku where we will spend the evening. This morning we travel north on Highway 14 to Kontum. Once in Kontum we will visit the Ave Maria 100-year old Rosewood Church and the Vinh Son Montagnard Orphanage. We return to Pleiku for our afternoon flight back to Saigon. Today is a free day in Saigon for shopping, personal exploration or just relaxing. Lunch is on our own. We gather tonight for our Farewell Dinner. After breakfast, we transfer to Tan Son Nhut Airport for our flight to Taipei. Departing from Taipei we gain a day enroute to the continental United States by re-crossing the International Dateline, arriving in Houston at approximately 11:20 p.m. this same day.